Sun, Oct 21, 2018, 10:41 pm SL Time, ColomboPage News Desk, Sri Lanka. Oct 21, Colombo: Train services on the upcountry line have been restored to normal after the service was suspended due to a derailment of a service train early Sunday morning. A service train service plying from Ella railway station to Colombo Fort carrying a crane derailed between Nanu Oya and Radella railway stations this morning. 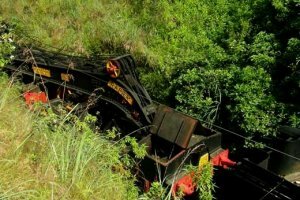 The upcountry train was restricted from Badulla to Nanu Oya and from Colombo to Hatton due to the accident. The service on the upcountry line was delayed for nearly six hours. The upcountry train service has been restored after the train was re-railed. From 11 pm Saturday three train accidents have been reported. In addition to the derailment on upcountry line in Radella, the Colombo-Kankasanthurai train at Ambanapola, and Colombo Batticaloa train 'Meenagaya' at Palugaswewa colliede with wild elephants. The collision of Colombo- Batticaloa train with two elephants killed one elephant and derailed the train. The Locomotive Drivers' trade union says only 14 out of 70 train engines in service have speedometers and the drivers control the speed of the train with their experience.